Russia increased its gold holdings by one million ounces in March, bringing its total reserves to nearly 40 million ounces or 1,238 metric tonnes. The Russian one million ounce gold purchase is a large one even by Russian standards as in recent years they have consistently been buying roughly 300,000 ounces per month. It followed a two month break from the gold market which had led to erroneous speculation that Russia was not interested in increasing its gold reserves any further. 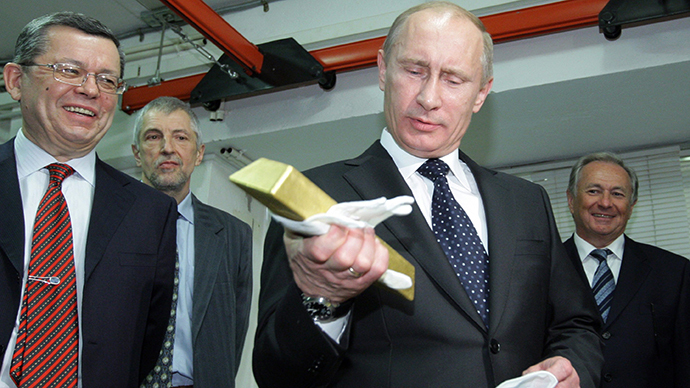 Since 2005, Russia’s gold reserves have increased three-fold. As a comparison, in the second quarter of 2009, Russia only had 550 tonnes of gold in its official reserves meaning that their reserves have doubled in recent years. Russia’s gold reserves are now at least the fifth largest national gold reserves in the world or sixth largest if one includes the IMF. Russia has consistently dollar cost averaged into gold throughout the global financial crisis and since the recent geopolitical crisis over Ukraine, their gold accumulation has increased. In the last nine months of 2014, in the midst of sanctions and the collapse in oil prices which led to sharp falls in the rouble, the central bank continued to buy gold, demonstrating the vital strategic importance placed by the government of Russia on the precious metal. The strategy has proven prudent as gold has acted as a hedge and protected Russia’s reserves from the declining value of the rouble and indeed the declining value of the euro (see chart below). 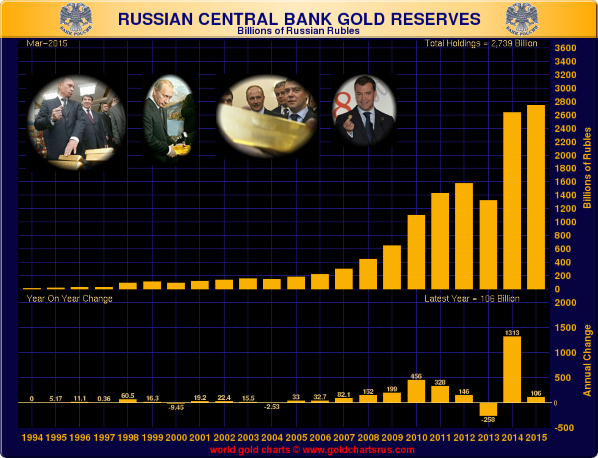 The ongoing accumulation of official gold by Russia is part of a reserve diversification strategy. Gold is held by central banks as one of their key reserve assets alongside foreign exchange assets including dollars and euros, and also IMF Special Drawing Rights (SDRs). Some Russian analysts point to the threat of continued western sanctions on Russia as a renewed catalyst for the Russian central bank diversifying out of dollars and euro by increasing its gold reserves. There is also the strong possibility that Russia is coordinating gold reserve accumulation with ex-Soviet States as we warned of last August. Given very close economic ties and cooperation between Russia, Kazakhstan and Belarus, and a trajectory towards economic union, it is probable that the these and other ex-Soviet countries are coordinating monetary policy which would include a common approach to official gold reserves accumulation. This will be worth watching in the coming months and years. Like China, it is possible that Russia and its allies may not be fully reporting their gold reserves accumulation to the IMF. It is not obligatory that they do so and given the very frayed relationship with Washington it seems likely that at some point the Russians may adopt the Chinese stance and not provide data on their gold buying to the IMF. The People’s Bank of China (PBOC) does not telegraph its intentions or gold purchases to the market as doing so would lead to a surging gold price and to a further devaluation of its foreign exchange reserves. 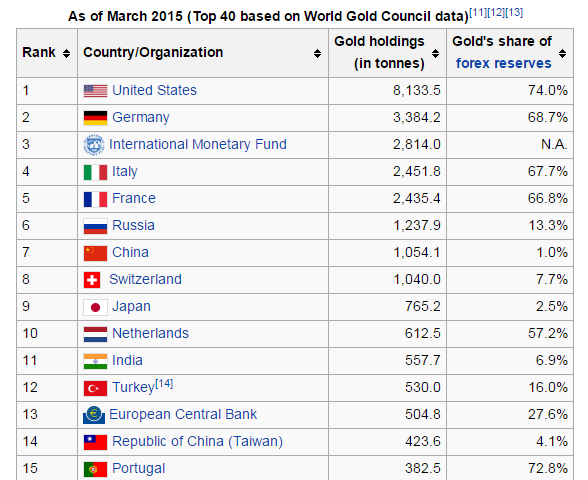 Aren’t the Russians likely to follow suit and either not declare or partially declare their gold reserve accumulation? Today’s AM LBMA Gold Price was USD 1,197.70, EUR 1,120.26 and GBP 804.58 per ounce. Yesterday’s AM LBMA Gold Price was USD 1,203.25, EUR 1,120.34 and GBP 806.31 per ounce. Gold fell 0.71 percent or $8.60 and closed at $1,195.90 an ounce yesterday, while silver fell 1.66 percent or $0.27 closing at $15.99 an ounce. Gold stayed below the $1,200 level as a stronger dollar and a rally in in global equities dimmed the yellow metal’s safe haven appeal for now. Spot gold in Singapore was down 0.2 percent to $1,194 an ounce near the end of day trading. 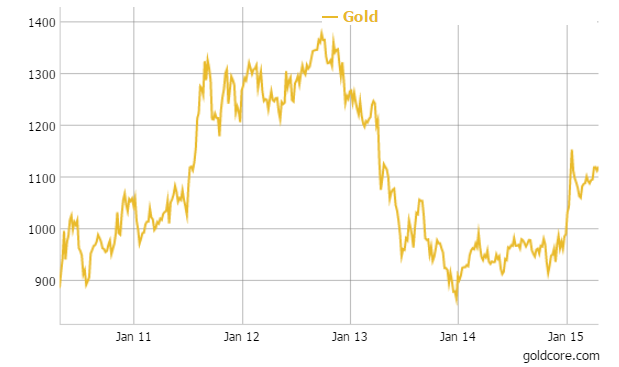 Gold priced in the beleaguered euro is up another 0.6% today given weakness in the euro. 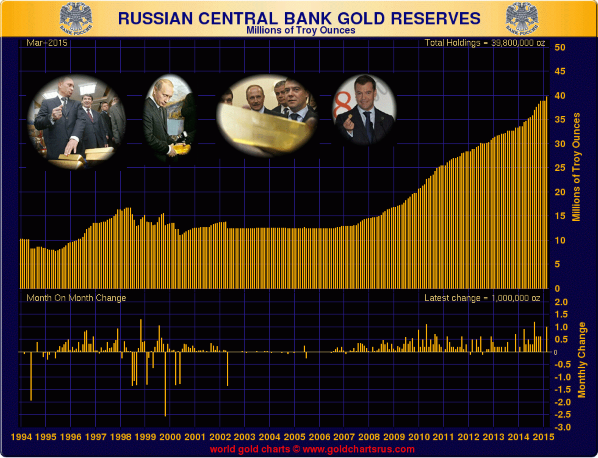 Russia’s increased its gold reserves to 39.8 million troy ounces as of April 1 from 38.8 million ounces last month, noted their central bank (see blog). Today, India celebrates the festival of Akshaya Tritiya which is one of the most auspicious days in the calendar to buy gold. Gold purchases in India are reported to have been slow today due to the poor monsoon. Indians are the world’s second biggest buyers of bullion and Akshaya Tritiya celebrated on today is usually one of the busiest gold-buying festivals along with Diwali and Dhanteras. Gold imports in India more than doubled in March to 125 tonnes from 60 tonnes a year before as the trade anticipated healthy demand. In Europe in late morning trading gold is up 0.2 percent at $1,199.90 an ounce. Silver is up 0.54 percent at $16.05 an ounce and platinum is up 0.27 percent at $1,152.50 an ounce.